Members of the Bereavement Ministry reach out to the family of the recently deceased to comfort them in their time of need and also to help them select the readings and music for their loved one's funeral. They also serve as Acolytes, Lectors and Eucharistic Ministers at Funeral Masses. The Bereavement Ministry follows up with the family through correspondence following the funeral as well as on anniversaries and during the holidays; and plan and coordinate the annual All Souls Day Remembrance Service. 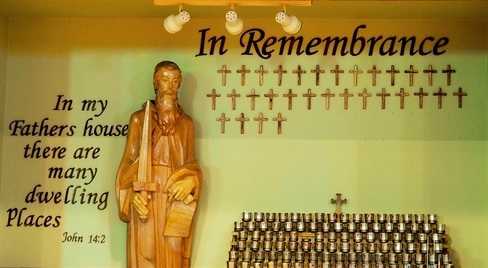 After each Funeral mass during the year, the name of the deceased is placed on a cross and kept in the church until the annual All Souls Day Remembrance Service. During the Service, families are invited to light a candle in memory of their loved one and then they are given the cross to take home. We are working to expand this ministry and welcome anyone who feels called to support St. Paul’s parish community at a time when its family members are experiencing the loss of a loved one. For information, please contact Debbie Stilson at (518)393-4052 or the Church Office at (518)377-8886.